I think it was waking up with the realization that it was officially autumn. Still, it doesn’t feel like fall. Sometimes in the southwest we have to make our own seasons. For me the easiest way is to turn to seasonal foods. When the weather is warm practically year round, you have to do what you can. I’m not bragging, just… Okay maybe I’m bragging a little. My mother had bought a loaf of French brioche, so I knew what must be done. French toast. Without hesitation, I leapt at the chance to gather supplies for a fall greeting breakfast. A drizzle or a drench– the choice is yours! Honeycrisp apple season might just be my favorite season of the year. LPT: If you haven’t yet sunk your teeth into one of these sugar snap apples drop everything now and run to the store. Should you find your store does not have these apples in stock, I’m working on a FREE downloadable template for a strongly-worded letter on the matter. Sure, it is also generic apple season, so if you’re more of a Granny Smith or Gala kind of gal– suit yourself. Little-known fact, it is also walnut season. Generally this season starts early September and lcoasts ‘til Thanksgiving. Granted you can easily buy nuts year round, but if you head down to the farmer’s market keep a lookout! 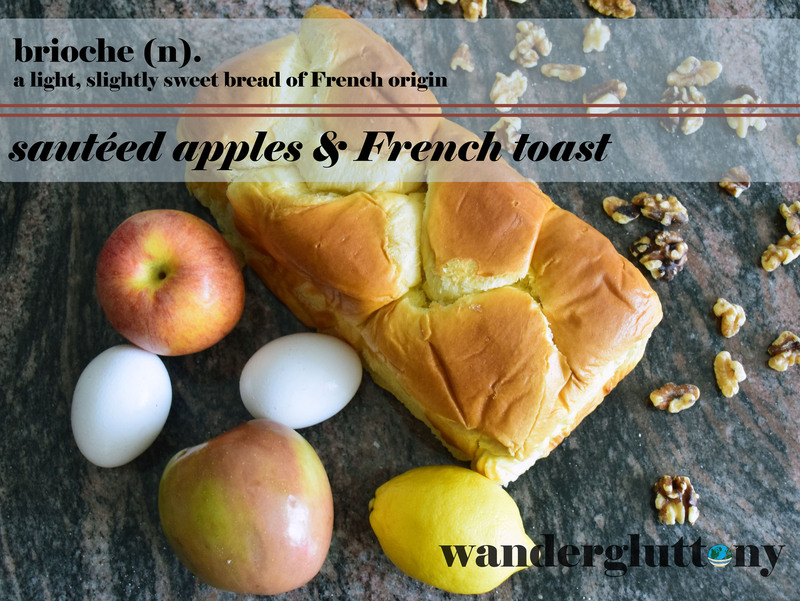 With the passing of Yom Kippur, I’d say you can even take this recipe one step more seasonal and have a challah French toast. Really, any way you slice it (pun intended) French toast is always a knockout and is easily prepared. Sometimes you can’t wait to sit and have to eat a slice in the kitchen. Preheat pan on medium heat, add butter. When butter begins to bubble, add in sliced apples flipping occasionally. Add fresh lemon juice and cinnamon when apples begin to show color, careful not to burn the cinnamon. Cook apples through until they have a seared appearance usually about 5 minutes. Whip eggs, milk, vanilla, and nutmeg together breaking down eggs fully. Preheat pan on medium high heat, add a bit of the reserved butter. Place the egg-soaked bread in hot pan once the butter is melted. You should be able to hear a satisfying sizzle. Cook on each side for approximately 2 minutes on medium flame or until the bread is toasted to your liking. Plate the slices with the sautéed apples and crushed walnuts. Add extra cinnamon, powdered sugar, and syrup to taste. Repeat for each slice, or eat the first slice and every man for themselves! That looks amazing! I will attempt to make this. Wow, that looks absolutely amazing! My mouth is watering and I’ll definitely be showing my husband this – french toast is his total favourite breakfast. Thank you! Let me know if you try it with your husband. I’d love to know what you think. I shouldn’t have looked that this before having breakfast… That looks so delicious! Although I’ve just finished my dinner this post had me salivating. Looks great and I’m sure I’ll give it a try soon. Thank you so much! If you do I’d love to hear about your results! This looks amazing! I love apple-based desserts. I’m not the biggest fan of breakfast food, either, but I love any form of cooked apples! I am totally the type of person who eats curry for breakfast, haha! 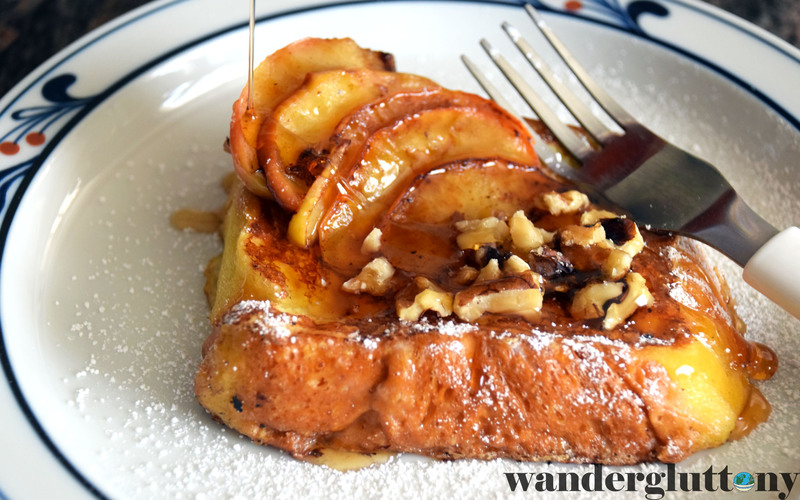 French Toast is my all time breakfast favorite! This looks delicious. It’s so good! And very easy to make. Looks so delicious! 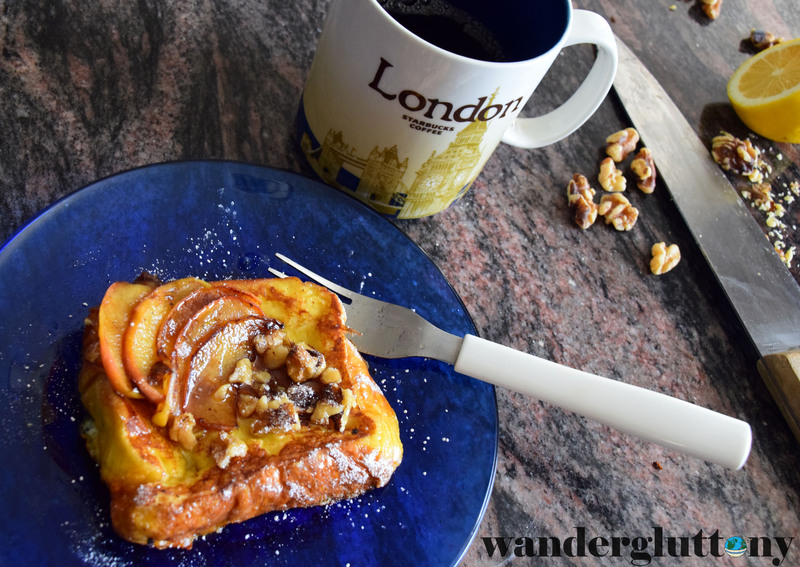 I love French toast, one of my all-time favourite breakfast options!